100% full-grain light brown leather with an easy off/on design. 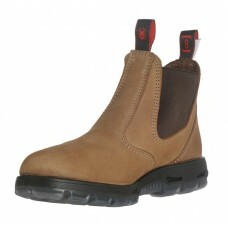 These boots provide increased traction on all surfaces as well as resistance to oil & acid. Removable foam inserts adds extra padding on top of the shock absorbing midsoles. Slip Resistant on oil, acid & water. Redback's unique Anatomic Sole cradles the foot to reduce arch sagging and prevents foot strain, fatigue and related leg and back pain. Redback boots meet and exceed ASTM F2413-11 standards for Electrical Hazards. These boots are perfect for fire, auto tech.